Anemones: a species of plant in the buttercup family. Also known as a Japanese wildflower. I had no idea what those were so I had to look that up. I figured I’d help out any others who weren’t born with a green thumb. I may not have known what they were but put them on a cake…….aaaaahhh-mazing! I love this cake. Adore it even. It’s sweet, simple, and modern. Can you believe this was a cake made for a class? I can’t…it seems too good. I hope that the baker, Lisa from Sweet Depositions Cakes, got an A+. This cake features the ever so popular double height tier and uses a sweet light blue and yellow color combination. 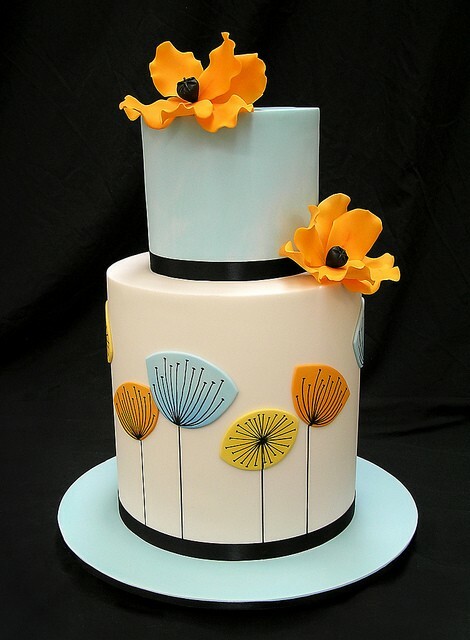 Lisa used three 9 inch cakes to complete the bottom tier and two 6 inch cakes to complete the top tier. It was covered in fondant and then Lisa used an edible pen to complete the gorgeous lines on the anemones. A serious steady hand she must have! You don’t even want to know what that would look like if I did it.